Do you LOVE roses in a landscape? Have you indulged your love of them many times over the years, only to lose them to pests or some fungus or powdery mildew? I do and I have and it’s very depressing – so eventually I gave up and thought I’d leave the roses to the “serious” garden people of which I figured, I was sadly not one. Until recently, that is, when something wonderful happened. I discovered the family of Knock Out Roses. Forget everything you know about roses being difficult to grow. 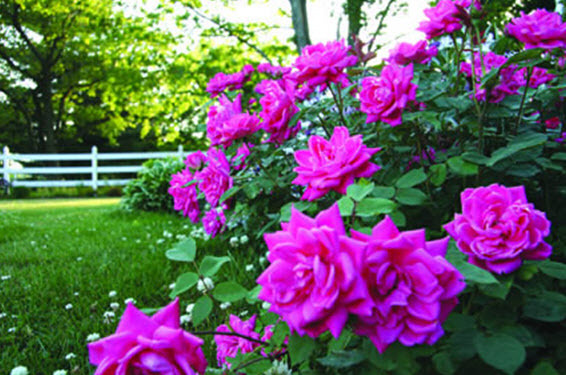 This family of roses is easy to grow and requires no special care. They are equally beautiful planted individually among other shrubs or make a stunning mass planting in a bed or border. A quick and easy prune in early spring after the last threat of frost is about all they require in that department. They thrive with a half-day of sun and will benefit from a boost of fertilizer that’s formulated for roses applied after the first bloom. Pests, especially Japanese beetles will eat them, but they are extremely resilient. You can get an insect spray or simply remove and dispose of them in soapy water. 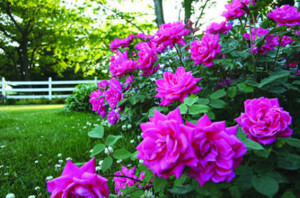 If you haven’t tried a Knock Out Rose in your landscape yet, you really should. They will, well, knock you out!